Chestnut trees are widely planted both as shade trees in landscapes and for their fruit. The trees come in Chinese, European or American varieties. However, the American native chestnuts are highly susceptible to the chestnut blight disease and are only recommended for planting in areas west of the Rockies. Given the high level of moisture in the fruit, chestnuts go bad rapidly if not dried properly. Chestnuts are among the nuts with very low oil content, containing only 8 percent oil in their fresh state. Fresh chestnuts have 50 percent water, and this makes the fruit highly prone to going bad and rotting. If dried properly, this water content is significantly reduced, which increases the shelf life and stability of the nuts. Dried chestnuts keep well for several months in sealed containers. The spoilage in chestnuts is indicated by visible rotting from the effects of fungi, yeasts and mold on fresh undried nuts. Chestnuts that are frozen immediately following harvest and then thawed later are also prone to going bad rapidly. 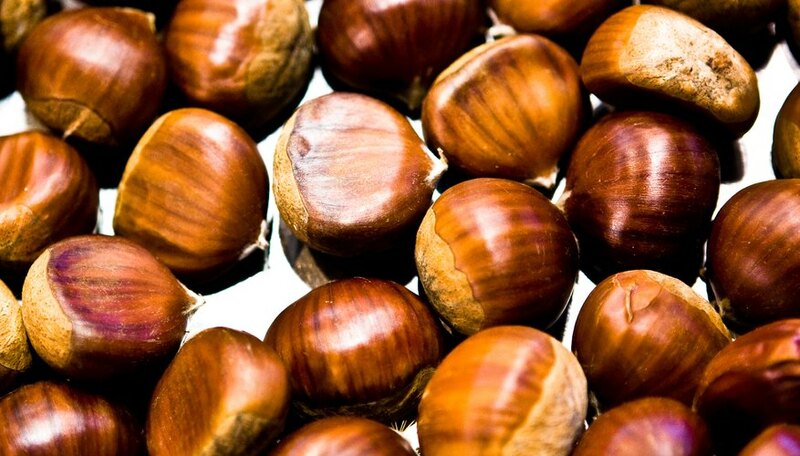 Freezing and thawing fresh chestnuts is generally not recommended unless it is done for a specific reason. If you wish to consume fresh chestnuts, purchase the fruit and use it right away. The best way to avoid spoilage is to make sure that the nuts are dried right away. Fresh or cooked nuts keep in the refrigerator for up to three weeks. Check fresh nuts for signs of mold and discard these. When washing chestnuts, do not soak the fruit, as this transfers mold spores from possibly bad nuts to all the fruit. Wash the nuts under clean, running water. Do not store the fresh chestnuts in sealed containers or plastic bags. Fill a bucket with water and add a few drops of vinegar. Place all chestnuts in the bucket and leave for 48 hours. Rinse the fruit and repeat the process two more times to make six days of total soaking time. During each rinsing cycle, remove and discard all fruit that floats, as this indicates the presence of worms. Place all nuts in a single layer in small or medium-sized crates and put the crates in sun. Move the crates inside at night to avoid damage from dew. It takes about a week for the nuts to dry.